Lives and works in Boston. Marylin Arsem is without no doubt one of the most important international artists and pedagogues in the field of action art, She has been creating live events since 1975, from solo gallery performances to large-scale, site-specific works. Arsem has presented work at festivals, conferences, alternative spaces, galleries, museums and universities in North and South America, Europe, the Middle East and Asia. 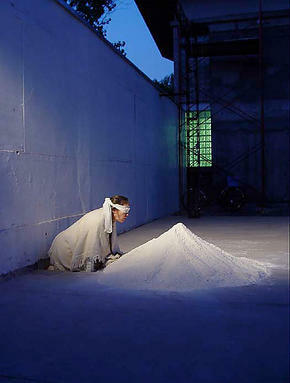 Most recently she has focused on creating site-specific performances, often in the context of festivals. These works are not planned in advance, but made in response to a location that is selected on arrival. Engaging with the immediate landscape and materiality of the location, its history, use or politics. Sites have included a former Cold War missile base in the United States, a 15th century Turkish bath in Macedonia, an aluminum factory in Argentina, and the site of the Spanish landing in the Philippines. Marilyn Arsem. Forgetting. PerfoPuerto Festival. Santiago, Chile. 2007. © Sofia de Grenada.